George Fiske was born October 22, 1835, in Amherst, New Hampshire, and raised on the family's farm. In 1858, at the age of 22, he moved west to Sacramento, California, looking for broader opportunities. There, he worked as a banking clerk for his half-brother Thomas Fiske, of Thomas Fiske & Co. It was probably serendipity, given his later career that this enterprise was located in the same building as the bank was the Vance & Weed Photographic Gallery, owned by Robert H. Vance and managed by Charles Leander Weed, the first photographer of Yosemite Valley. In the years following his removal to California, Fiske received extensive of photographic training. It is not known, however, from who he learned and when. However, in 1864 he was working as a freelance photographer in San Francisco. 1868 found him having returned to farming for a brief time in the Santa Clara Valley. After this, Fiske returned to San Francisco and became an assistant to Carleton E. Watkins. Over he next few years Fiske was employed as a photographer for Thomas Houseworth & Co., then worked with Eadweard Muybridge photographing the Yosemite Valley. Then tragedy struck. In a one-year, between 1872 and 1873, Fiske lost his mother, father and half-brother James, and married his first wife, Elmira ("Myra") F. Morrill. After these events, in 1874, Fiske returned to work for Watkins. The following year Watkins went bankrupt, causing another dislocation in Fiske's career. For some time during this period Fiske carried out a photography practice in San Francisco. He then relocated in 1879 to the Yosemite Valley, becoming its first year-round resident photographer, where he lived for the rest of his life. By 1884 Fiske had begun to receive substantial recognition for his photographic work. After seeing Fiske's prints on exhibition at the New Orleans World's Fair, the influential Philadelphia Photographer critic Edward L Wilson commented on the Fiske work, saying they were "gems of photographic art." Wilson expressed the opinion Fiske occupied the "front rank" in photography. 1884 was also the year, Fiske sent a selection of his photographs to London for the inspection of John Ruskin, who replied, "It is impossible to choose subjects more fitly, or to do better work." In 1896, Myra Fiske died of cancer. The following year George Fiske married Caroline ("Carrie") Paull, who he met in Yosemite Valley while she was vacationing there. In 1904 a fire destroyed Fiske's house and studio, as well as two cameras, two lenses, three quarters of his glass-plate negatives, and a large portion of his stock of prints. Renowned photographer of Yosemite Valley famous for his quality images that are highly valued & greatly in demand. Married 1st to Elmira (Mira) F. Morrill of San Jose, who he married April 16, 1873. 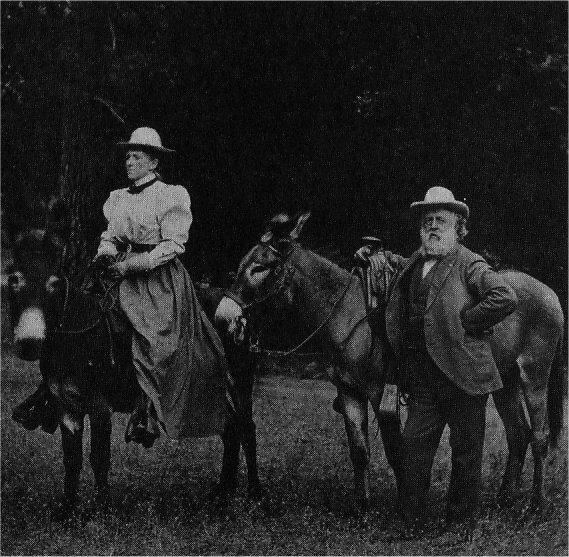 After her death of Cancer in 1896, Fiske married Caroline (Carrie) Paull about 1899. Preceded in death by Carrie in 1917 George became ill with severe headaches (possibly caused by the use of photographic chemicals used in developing) & committed suicide on October 20, 1918, one day before his eighty-third birthday. He is buried beside his 2nd wife, Caroline. Arthur C. Pillsbury took this photo, turned into a post card so the two men could send these back to New England to their families. Pillsbury, Fiske, and Pillsbury each had roots in towns in New Hampshire only a few miles apart. 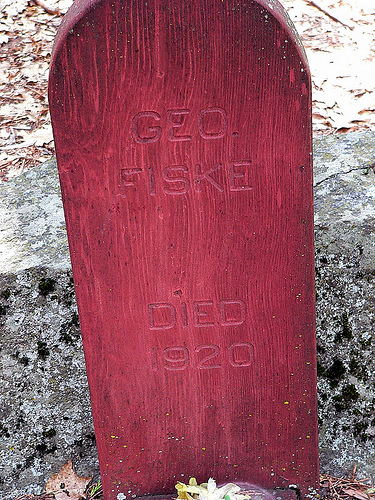 After the deaths of Galen Clark in 1910 and his wife Carrie in 1917, Fiske become very despondent. In 1918, facing dim business prospects and suffering intensely from a brain tumor, George Fiske committed suicide. He was buried next to Galen Clark in Yosemite's Pioneer Cemetery. Along with the negatives of Julius Boysen, a fire in 1943 fire is believed to have destroyed the remainder of Fiske's glass-plate negatives. George Fiske (U.S., 1835-1918): "Spirit Land. Up the Valley." George Fiske was the first photographer to be a year-round resident of Yosemite; this is arguably the most dramatic of his many superb studies of that spectacular valley. To Ansel Adams--himself a longtime resident of Yosemite Valley--the photographs of George Fiske have special meaning. For as a young man in the 1920s, he made many prints from the Fiske negatives acquired by the Yosemite Company from the estate. These represented only a part of Fiske's lifework, for in 1904 three-quarters of his negatives, his cameras, his lenses and a large part of his stock of prints were destroyed in a fire that consumed his house and studio. In the thirties, Adams became much concerned with the safety of the remaining negatives, for they were carelessly kept in the attic of the company's sawmill. His suggestion that they be stored in the fireproof basement of the new museum building was ignored. In 1943 the sawmill burned to the ground; all that were left of Fiske's negatives were destroyed. 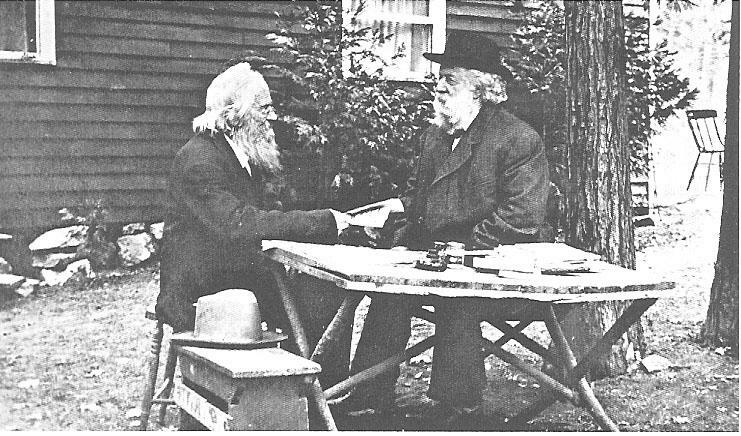 "If that hadn't happened," Adams stated, "Fiske could have been revealed today, I firmly believe, as a top photographer, a top interpretive photographer. I really can't get excited at Watkins and Muybridge--I do get excited at Fiske. I think he had the better eye."